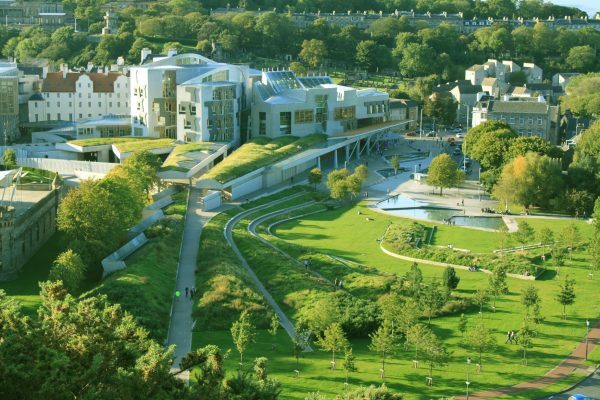 Home Blog The greenest ever Programme for Government? Today’s new Programme for Government contain a number of very significant steps forward on climate change and the environment. Even better, at the same time there were no new big steps backwards – no new road building, no airport expansion proposals, no suggestion that North Sea oil will flow forever. Is this the greenest Programme for Government we’ve ever had? In launching the policies and new bills Nicola Sturgeon certainly talked about climate change and innovation in green technologies extensively. She talked of our moral responsibility to tackle climate change, and stated commitment to doing our ‘full share’ of global efforts to limit warming to 1.5 degrees. Instead of continued dependence on fossil fuels the Government is planning to phase out the sale of fossil-fuelled vehicles by 2032, among the most ambitious commitments of its type in the world. A Just Transition Commission is to be created to advise the Government on how to move to ‘a more resource efficient and sustainable economic model in a fair way’. This is really important because it signifies an implicit acknowledgement that the oil industry has a limited future shelf life, but critically, it also recognises that this transition must be planned and fair. Set up and delivered right, this might be the most important new commitment in the Programme. Low emission zones in all our big cities will make a real difference to the daily lives of many people, drastically reduce the 2,500 annual death toll from air pollution, and improve the life chances of children growing up there. Doubling the money going to cycling and walking will also help people make better, healthier choices, and improve the places we live in. There are also plans for a Scottish National Investment Bank, which could help fund renewable energy, public transport and desperately-needed social housing. Tackling the ridiculous mountain of waste we produce, including the tonnes of stuff that ends up in the sea, is another priority. Following the success of the plastic bag tax, a full deposit and return system for drinks containers will be introduced, and a deposit on disposable cups could help curb the 250 million that just get chucked every year in Scotland. Of course, there is a lot to do to make it all real. We urgently need to know where the first low emission zone will be located, so that buses, lorries and big vans can all be included by the 2018 deadline. The Just Transition Commission must have the right people round the table, the right remit and the right access to the top level of government. Similarly, the National Investment Bank will need the right priorities if it is to do good not harm. This package of new promises will make a big difference in helping make sure Scotland delivers its fair share of global efforts to meet the Paris Climate Agreement. The target to end the sale of fossil-fuelled vehicles by 2032 is way ahead of the government’s previous offering of 40% of sales to be non-fossil-fuelled by the same date. Reducing plastic waste will also save climate emissions in manufacture and transport, and helping walk and cycle instead of drive will also help. These savings mean that the draft climate change plan from earlier this year can build in more ambition, which in turn means the forthcoming Climate Bill can aim much higher than the current lacklustre proposal. There is a bit of competition for greenest ever Programme for Government. The first one, back in 1999, promised national parks, land reform and a progressive transport bill. The one in 2008 was particularly full of goodies – major new laws on climate change, flooding and the marine environment. But for the overall positive difference that will be made to people’s lives and to the move from a dirty, wasteful economy to a clean, efficient economy, yesterday’s document is clearly the greenest Programme for Government ever, and we look forward to its urgent implementation. A shorter version of this blog appeared in the National on 7 Sept 2017.